Lightly brush vegetables with canola oil and season with salt and pepper. Place vegetables on the grill. For the peppers, place on the grill whole and grill each side for 3-4 minutes. Grill the zucchini, squash, and red onion about 3-4 minutes per side. (so you get char marks) and lastly place the cherry tomatoes in a grill basket and grill for 3 minutes. Remove all the vegetables and place in a bowl to cool. Once cooled, roughly chop all vegetables. Place in a large bowl. Next, season ciabatta bread with canola oil. Place the inside part of the grill, grill the bread for 2-3 minutes until slightly charred. 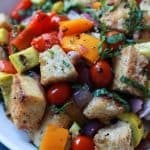 Remove from grill and cut bread into 1″ cubes. Set aside. In a small bowl add white balsamic vinegar, olive oil, mustard, honey, salt, and pepper. Whisk together until combined. Add bread to the large bowl with chopped vegetables, drizzle dressing on top and add in chopped basil.